Derrick Gordon is a young man who started his silversmithing career in 1990. He is best known for his complex and precise stamp work which covers the entirety of each piece of his jewelry and his use of top quality stone materials. His work is very traditional Navajo style. This is truly a one-of-a-kind belt that is just amazing. 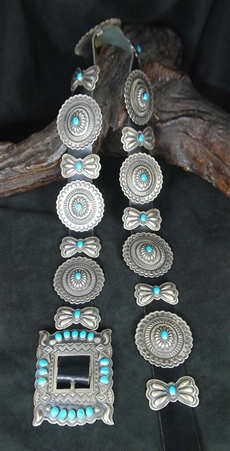 This beautiful concho belt features classic, natural clear blue Sleeping Beauty turquoise. Each of the 8 concho's, 9 butterflies and buckle have intricate stamp work and repousse on each component. Each concho measures 2" long by 1 7/8" wide. 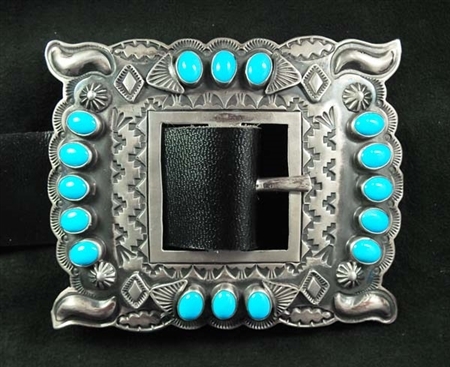 The beautifully stamped buckle measures 2 3/4" x 2 7/8", with an overall length of the concho (with leather) being 50" long. A lovely matt finish and light patina graces the entire belt. 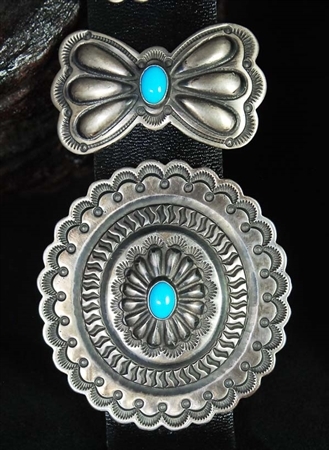 Just an outstanding concho belt with beautiful turquoise stones! Hallmarked.